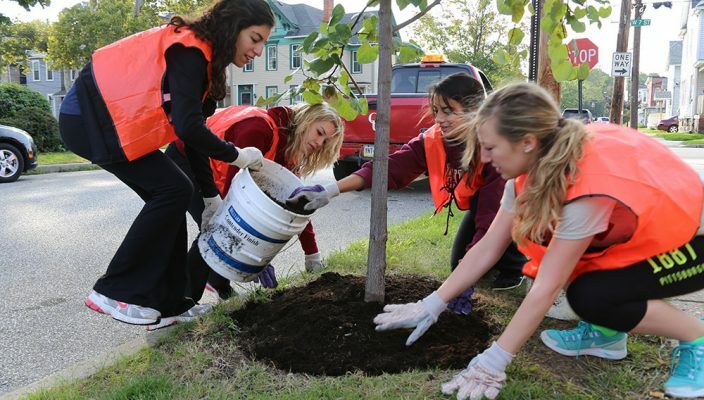 Gannon’s Invitation to Volunteer Everywhere, or GIVE Day, is a one-day service event that sends a quarter of the Gannon Family into the community to do service. GIVE Day is hosted by the Center for Social Concerns and will take place from 8 a.m. to noon Saturday. Projects range from litter pick-ups in the West Bayfront and Presque Isle to helping residents of low-income senior living facilities do heavy work that they can’t to building houses with Habitat for Humanity, and everything in between. Students, staff and alumni participating in GIVE Day will meet in the Hammermill Center at 8 a.m. Attendees will get to enjoy doughnut holes and registered volunteers will receive their GIVE Day T-shirt to wear. Organizations will gather into their groups before going out into the community for their assigned service project from 9 a.m. to noon. Sara Nesbitt, the program director for the Center for Social Concerns, said GIVE Day grew out of previous Gannon service events designed to complement current community service projects and potentially help students find long-term service sites. Claudia Mokwa, a TRIO Student Support Services (SSS) adviser, has been leading the SSS group for GIVE Day since the fall of 2012 and will be leading the students again this year. “The idea for SSS to participate as a group at GIVE Day came from an SSS student during a focus group session,” Mokwa said. Mokwa enjoys GIVE Day because she gets to help the Erie community in some way. “The main reason I do it is because I get to connect with SSS students, especially the new students,” Mokwa said. This year, an Academic Affairs competition is being added to GIVE Day. For the competition, the college that has the highest percentage of participation will earn the coveted GIVE Day Cup that will be held in the dean’s office of the winning college for one year. The cup will be presented at an ice cream social for all the Academic Affairs faculty and staff who participated. All staff, faculty, adjuncts and family members will count in the calculations. The date of the ice cream social has yet to be determined. Medina Klino, a sophomore accounting major, participated in GIVE Day last year with Commuter Life. The commuters were sent to Presque Isle to clean up the beaches. “I choose to participate in GIVE Day because what may seem small to me could be a lot to someone else,” Klino said. Students will be giving back to the Erie community and will be located throughout the area. Some of the locations this year are SafeNet, the Pennsylvania Soldiers’ and Sailors’ Home and L’Arche Erie, Inc.
Joey Lueck, a senior biology major, has engaged in GIVE Day for the past three years because he loves to volunteer. If you haven’t signed up yet but are interested in partaking in this year’s GIVE Day, email Sara Nesbitt at nesbitt002@gannon.edu.